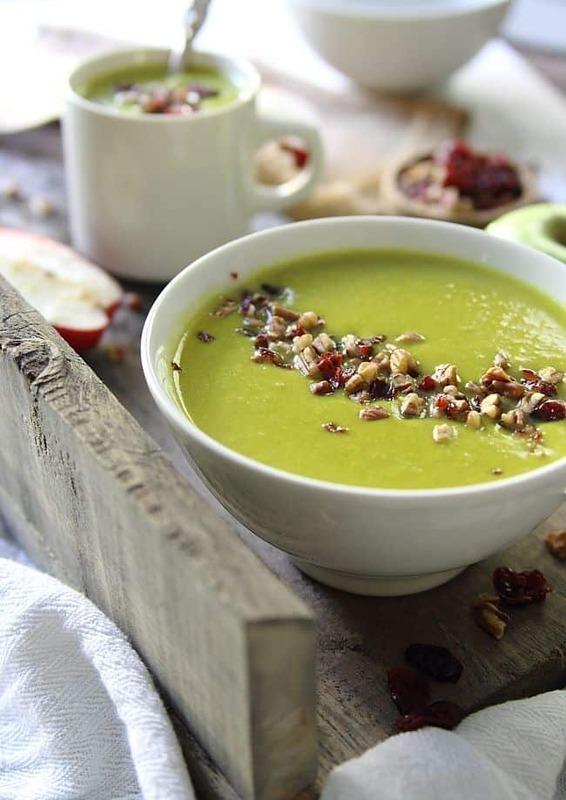 This leek apple cheddar soup is sweet, creamy and topped with chopped walnuts and cranberries. I had a distinct vision of what this soup would end up looking like days before making it. In my head it was a warm yellowy orange, a visual representation of the loads of cheddar melted into the apples and leeks. But then I got to actually making it and realized puke green was a more likely outcome. Good news is leeks, apples and cheddar taste nothing like puke and everything like warm fall deliciousness. I was at Trader Joe’s yesterday (at noon on a Sunday, sometimes I question my sanity) which had gourds, pumpkins and mums galore in pretty much every crevice of the store tempting me every time I turned the cart up another aisle. I somehow walked away with only three small white pumpkins and a $3.99 fall bouquet. I came home, pulled the fall and Halloween decorations out of the closet, arranged my bouquet on the table and got this soup going on the stove while Ulysses lit the chiminea out on the deck. We put on sweatshirts and wrapped our hands around a steaming bowl of this leek apple cheddar soup for dinner while Ginger chased acorn obsessed squirrels up trees in the backyard. I can’t really say I love New York too often but right now with the weather, the leaves and this soup, I’m digging it. Heat butter and olive oil in a large pot or dutch oven over medium heat. Add leeks and apples and cook for about 10 minutes until softened. Add flour to the pot, stir and cook 1 minute. Add turmeric, salt and pepper taste and stir to coat. Add the apple cider and vegetable broth, bring to a boil, stir then lower to a simmer and cook another 10-15 minutes until vegetables are very soft. Turn off heat and blend the mixture in batches in a blender until smooth. Or, you can use an immersion blender. Return soup to the pot, turn heat to medium and stir in cheese until melted. Ladle soup into bowls and garnish with walnuts and cranberries. I love the color! Wow, so vibrant and awesome! Sounds amazing, Gina. Pinned! The fact that I was not invited to drink soup in front of the fire with you both is upsetting. I want this soup in my life! 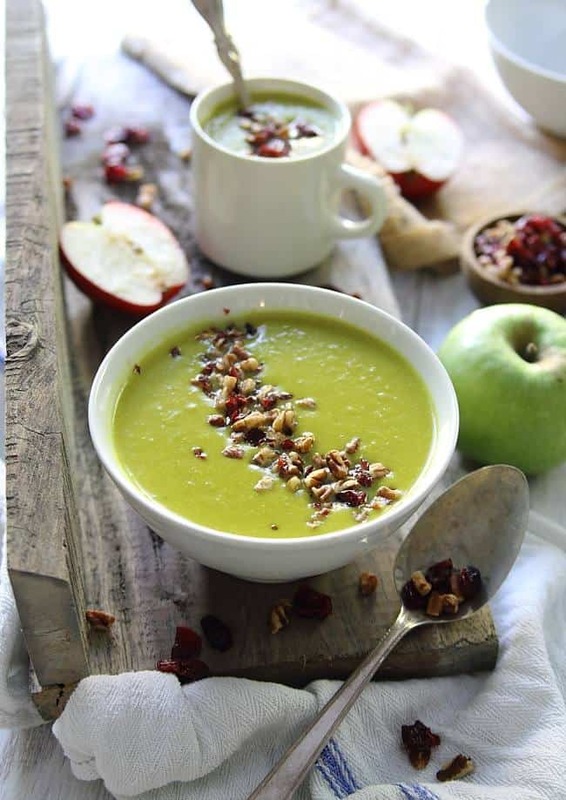 I love leek soup, this looks so tasty and comforting! What a great combo of flavors, and I am always looking for new soup recipes! Love it. LOL, well I think it’s gorgeous! I always have that experience — the wake-up call between what I imagine something will look like and what I actually end up with. I would never have thought of this combination, but it sounds lovely, and leek is a vegetable I just do not use often enough. We had it a lot when i was in England, but since i moved here, I pretty much forgot about it. I love that green! What a beautiful color! wow, the colour of this soup is an absolutely mystery to me — I better have a chat with my under-performing leeks ;-). Love the play between the green and your gorgeous walnut-cranberry garnish. Wow, Gina! This soup is so beautiful and vibrant! Such a great combination of my favorite flavors…but honestly, I’d have never thought to put this all together…I can’t wait to try it! Pinning to make for dinner tomorrow night! I’ve got everything I need to make it! The color of that soup is what makes the pictures pop so much and makes me want to grab a spoon right away and dig in. Now if only you could pass that cool fall NY weather down here to Texas… ugh.. dying down here in the heat. But still eating soup… because gosh darnit its stinking fall and soup is “my jam” in the fall! Loving this dish Gina, seriously can’t wait to make it! This sounds like an amazing flavor combination! Your photos make it look beautiful as well! That sounds like the perfect fall evening. This soup looks amazing. I love that you added sweet, tart apples. Pinned. Sometimes I just don’t know how you do it. What an unusual – and totally delightful – combination of flavors. This may well be the perfect fall soup! i dont know how you guys deal with so much cold in NY..although the idea of soup, fall weather, and sweatshirt sounds very tempting. Ooh, hooray! 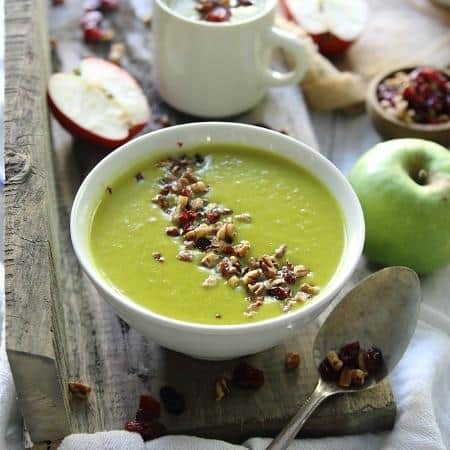 I love the idea of mixing up a traditional savory soup with a little apple. Sounds perfect with leeks and cheese! This soup looks so comforting and living in AZ, I’m totally jealous of your fall weather! oh my gawd, love all the flavors you have going on here!! I think it’s time to upgrade my fave leek and potato soup! This soup is delicious even without the cheese! Adding cranberries is a master stroke. It not only enlivens because of the color combinations but it taste wonderful. Thank you so much for a wonderful recipe!